The Tallis Scholars have made an enormous impact on our modern understanding of Josquin des Prés (c. 1440-1521) and without their contribution it is very likely that he might still be considered as a minor composer. 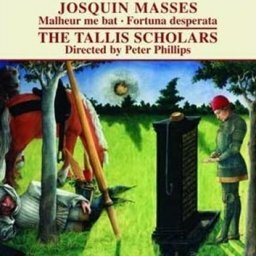 In 1987 The Tallis Scholars (Gimell Records) became the first independent label and the first early music recording to win The Gramophone magazine Record of the Year with their album of Josquin's Missa Pange lingua & Missa La sol fa re mi, and after this success the L'homme armé Masses followed in 1989 and Missa Sine nomine & Missa Ad fugam last year (Diapason D'or, Choc du Monde de la musique). This is their fourth disc devoted to his masses and a fifth is due out in 2010 by which time they will have recorded more-or-less half of his (attributed) masses. The Tallis Scholars sing both masses with their trademark clarity and stylish phrasing. Peter Phillips paces the music beautifully and, as ever, negotiates Josquin's tricky section changes with panache. This is an ensemble with considerable experience of the idiom and the quality of their performance can be heard as clearly in the exposed two-voice textures as it can when the ensemble is augmented in the latter Agnus sections. Finding a unique and immediately identifiable sound has been one of the major achievements of The Tallis Scholars throughout their recorded history. A whole generation of musicians has now grown up listening to their performances and as a result Peter Phillips and his ensemble can safely claim to have influenced the current success that the sound of British singers in early music enjoys all over the world. However, it would be wrong to assume that this meticulous style has remained entirely unchanged. I would like to think that The Tallis Scholars allow themselves to be influenced by the music they sing - like in this album, with it's lower superius parts that steer away from the characteristically stratospheric soprano sound lending themselves to a gentler, mellow tone backed up by the use of high-tenors on the Altus. In the second mass the Altus (the top part here) is shared by Tessa Bonner, Caroline Trevor and David Gould – a soprano, a mezzo and a countertenor – this highlights the outstanding versatility of these singers and the wide variety of textures that they can produce. I can also detect a small but definite move towards a bigger vocal sound when comparisons are made with much earlier albums which suits Josquin's music very well. Touchingly, this album is the last that Tessa Bonner recorded with The Tallis Scholars before she died following a year's battle with cancer on New Years Eve. Her distinctive sound and keen musicality, so prevalent across her 37 albums with this ensemble, will be much missed. Apart from being another musical triumph this album is therefore also of great sentimental value to those of us who have been touched by this music through Tessa's singing. For a limited period of time Gimell Records are providing a free download track from this album on their website. Gimell have one of the most comprehensive websites that I have seen in the classical music industry and they offer downloads for the vast majority of their catalogue in many formats including the standard Mp3 but also FLAC lossless format encompassing Studio Master and Studio Master 5.1 releases. So if you have advanced hi-fi equipment you can now, finally, download in a format worthy of such reproduction, which is a great comfort for those of us that have previously found that digital compression has tended to champion convenience over quality.